Since the early ‘90s, I have been intrigued by the problem of orbital debris in space. Upon learning that the U.S. Space Command tracks over 10,000 of these orbital debris objects, and that the orbits of each of these objects is known and predictable, I was fascinated by the idea of creating from this orbital debris, a site-specific artwork—in space—on a scale previously unheard of. Created in 2003, in collaboration with the Naval Research Laboratory (NRL) and French composer and Université de Paris-Sorbonne Professor, Marc Battier, COLLISION II is a dynamic orbital debris site-specific artwork currently in Sun-synchronous orbit at an altitude 450 to 900 kilometers above Earth. Reflecting further on this idea, I realized that there was also music in the motion of these orbital debris objects—relative both to one another and to the Earth. The Naval Research Laboratory, using a massively paralleled computer and tracking data from the U.S. Space Command, created the simulation that you now see. 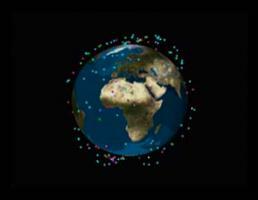 In the beginning of this video, the more than 10,000 orbital debris objects that now comprise the orbital debris catalog are precisely shown as they orbit the Earth. To create COLLISION II, I established certain parameters in the selection process that eliminated all but 192 orbital debris objects out of the 10,000-object catalog. These 192 objects—color coded by country of origin—are shown in the second part of this video simulation. Utilizing a spectacular 3-D holographic display, COLLISION II was first exhibited at the International @rt Outsiders festival 2003, Maison Européenne de la Photographie, Paris. Marc Battier composed the exciting music heard on this COLLISION II video, based in part on orbital debris data provided by the NRL.